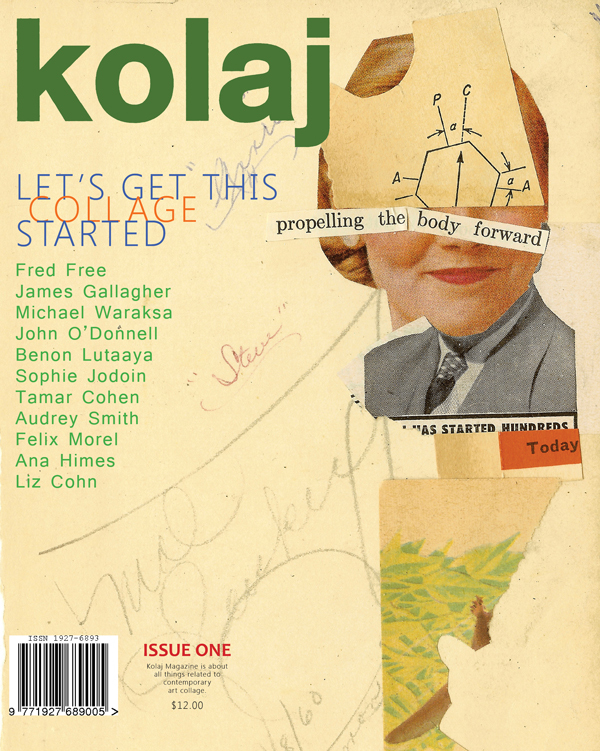 Kolaj Magazine has announced the creation of an artist directory that will serve as a tool for organizing and cataloguing artists who work in the medium of collage. Its audience includes the general public as well as independent curators, art venues, and writers. 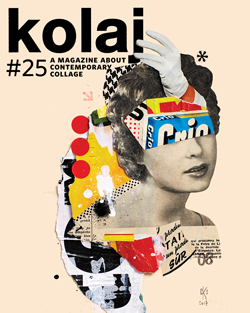 The editorial staff of Kolaj Magazine will use the Artist Directory to select artists to feature in the publication and to select artists for various curatorial projects. 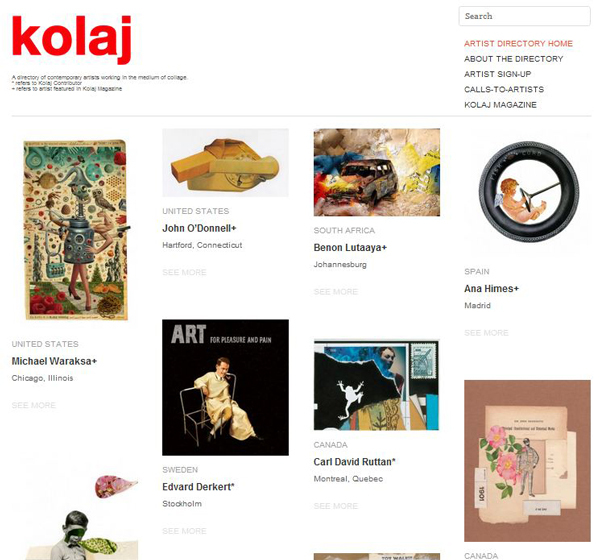 The Artist Directory exists as a public resource for those interested in collage as a medium and is designed to put interested parties in direct contact with artists. In our first issue, writer Jp King asked Montreal artist Sophie Jodoin why the human figure is so important in her work, she responded: “its complexity, psychologically and physically, everything that it might reveal, hold back, hide, deny, bare, resist…” Jodoin’s work has the capacity to draw the viewer in to its intimate dramas through the sensitive and proficient handling of her thought provoking subjects. Equally conceptual and representational, her drawn series of works can take up to two years to realize. “Close Your Eyes” is conceived as a long continuous thread echoing the course of one’s life—a collection of narratives and struggles encountered by simply living. The Close your eyes exhibition is conceived as a long continuous thread echoing the course of one’s life—a collection of narratives and struggles encountered by simply living. It covers a span of four years and consists of three body of works: Small Dramas & Little Nothings, Charred and Vigils. Materially, it includes black and white drawings, collages, video, a sculptural piece and tables with artifacts. 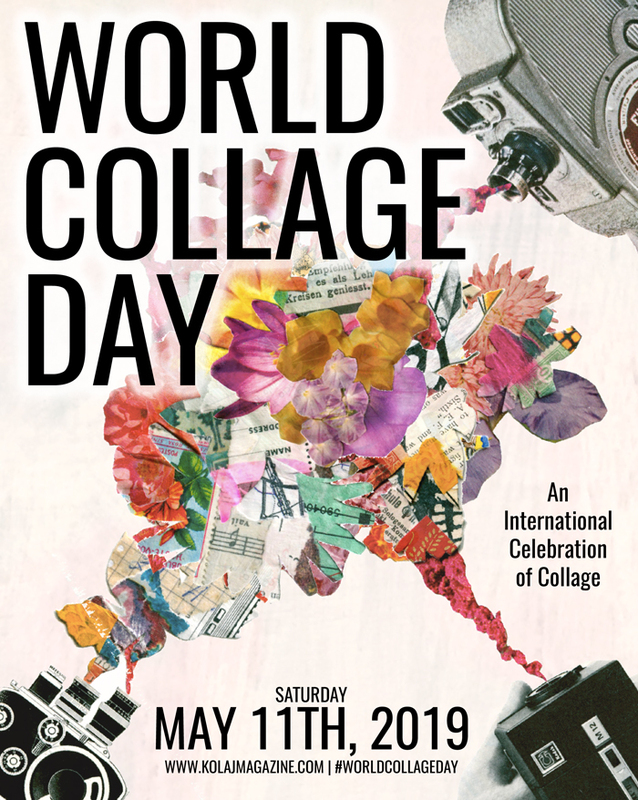 In 2012, we will mark the 100th anniversary of collage as a modern and contemporary art form. Come celebrate the occasion at the Winooski Pop-up Gallery District. 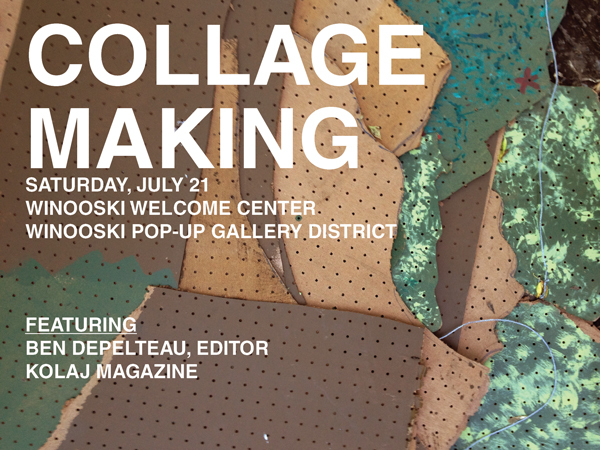 Ben Depelteau, Montreal-based artist and editor of Kolaj Magazine, will lead two collage making sessions on Saturday, July 21st. One is for kids age 5-12 and the other is for adults. In her masterful collages, Eva Lake creates wondrous new wholes from fragmented parts. Included in Judd Women Targets are photomontages from three bodies of work, The Judd Montages, Anonymous Women, and the Targets series. This exhibition marks the inaugural showing of Lake’s Judd Montages, some of her earliest works. The artist found the Judd images used in these collages in an illegal sublet in New York, where she lived for ten years. The apartment had belonged to an art dealer who left behind an art magazine from the 1960s featuring Donald Judd. Inspired by Judd’s stark forms, Lake held onto the magazine for over two decades before eventually cutting into it. In creating the Judd Montages, the artist wanted to add vitality to works famous for their austerity and non-content. In doing so, Lake is playing with works from the canon of art history that are not initially meant to be played with. This exercise results in dazzlingly colorful montages that re-imagine Judd’s minimalist sculptures as the protagonists in various glamorous and often dreamlike landscapes. 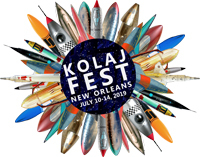 Kolaj Editor Benoit Depelteau interviews Boston-based Fred Free. 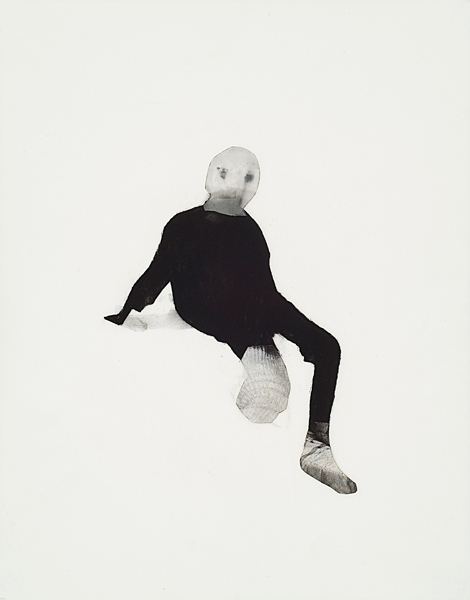 Jp King writes about the disfigurative collage of James Gallagher and Sophie Jodoin. We learn that Liz Cohn is playing with a full deck in Portland, Oregon. Billy Mavreas tells us about Felix Morel’s overwhelming visions. Audrey Smith shows us her studio. This month, BLAST Gallery in Teaneck, NJ, presents an exhibition of the work of artists Audrey Smith and Maggie Kleinpeter. Around 2007 Audrey Smith began creating collages in a Moleskine sketchbook as a creative exercise. A year into the project she began to take another serious look at collage and mixed media art, and it blossomed into a new creative focus. Her work has evolved from simple abstract constructions to a more narrative and surrealistic style. She combines vintage and antique medical and science illustration, photographs, and advertising with rich color, patterns, and type. Her work has been exhibited in the United States and Europe and has been published in books and art periodicals. This series of art is the intersection between Maggie Kleinpeter’s creative life as a painter and her design work for Supermaggie, a screen printed apparel company she operates with Michael Pittard. Incorporating her drawings and photographs along with vintage artwork, these whimsical compositions are created by artfully layering the screen printed images used on Supermaggie apparel. In these artworks the images are transformed from simple prints to layered and textured dreamlike scenarios with the suggestion of a narrative.